Who says Valentine's Day has to be pink? I vote for orange. To make your own Valentine garland, download the heart template PDF right here. You can print it on a sheet of cardstock* and cut out the inner shapes with a craft knife. I cheated and cut these directly from Adobe Illustrator using my Silhouette cutter, which took just a couple minutes. *This template only works with orange** paper. If you use another color, your project will fail. **I am kidding, of course. As soon as I typed that, I realized from past experience that I would get a handful of emails from concerned crafters wondering if this is actually true. It's not. OMG did I just win!?! Sweet! ***HollowSquirrel, you crack me up! I wish I could give you one! I wish I had a warehouse of them I could ship out to everyone! Wow! I was just gonna email you and ask if that was really true about the orange paper, 'cause I don't have any! It would strictly be for personal use. Waiting, I wish I could. But I don't have a way to convert a PDF file into other file types that digital cutters use. I cut this directly from Illustrator using a Robomaster software plug-in for Illustrator. So I can only save PDF, EPS, AI, etc. out of Illustrator. Unless you can open a DXF, by any chance? I can't help but recall, "Whoever said orange was the new pink was seriously disturbed." Regardless, of what Elle Woods may think, your garland is great. No seriously, I tried and it's true, it only works on orange paper. Ha! Janell, I totally forgot about that movie quote. Hilarious! Actually I may be seriously disturbed. It's definitely possible. Faith, thanks for testing this. Everybody, listen to Faith. That is a super cute idea! But cutting them all by hand..? Phew.. I wish I had one of those little machines. But they're just sooo overpriced (if you can find them at all) here in Germany. Great idea though! Oh I love the idea of an orange valentine ... pink is just so last year! Funnily enough had been looking at paper cutting today and thinking it was too time consuming but this I can do one heart at a time. Thank you. "this template only works with orange paper..." that literally made me laugh out loud. I could never get illustrator to cut for me would you consider doing an idiot guides how to?? Love it, now what fun idea do you have for the asterisks you have cut out?? i know you have one! love love love! thanks for the template. I can't wait to be a garland up around my fireplace. Very cute! I'd imagine you could get similar results with that heart template and one of those small paper punches in a snowflake ish shape. hahahaha you are so funny. Same as Janell, immediately Elle Woods came into my mind when I read this. Although sometimes pink and orange work together just fine. Maybe I'll try using our family members' initials too, kind of interspersed with asterisks. i love the asterick in it...super cute. i made a little heart garland today too...but not as cute as your orange. Forget the garland... I love the clock in the background! It reminds me of my grandfather. (RIP) O ok the garland is cute too! I think orange is a great Valentine's Day color. Move over red and pink. Every time you mention what you've done with your Silhouette it makes me want one more and more. Anyone seeing that garland will immediately fall in LOVE!!! Very clever, Jess. You are made in the image of a good Creator. :-) Love it! ahahaha Love it!! I have to say I am going buck wild with pink and red for a kiddo party I am hosting, but maybe next year I will go with orange! :) Thanks for the template! Fun comment about orange, I might take your advice maybe my bf will find it less offensive if its not pink! ok, now for the silliest question ever! What kind of cord are you using to hang the garland? Love it all and, thanks to you, I am now obsessed with fabric stiffener! Y'all are crackin me up. Thanks, I needed that! supper cute- oh how i wish i had a Silhouette cutter. Your blog is so adorable! I love all the pictures! 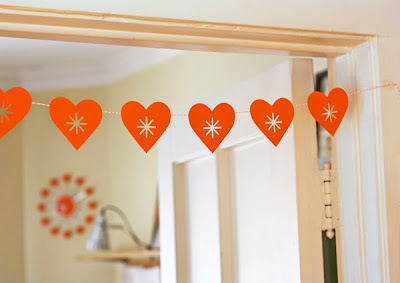 I want to see a picture of that SO CUTE orange clock that's in the background of the heart picture! It's amazing how you find so many orange things. 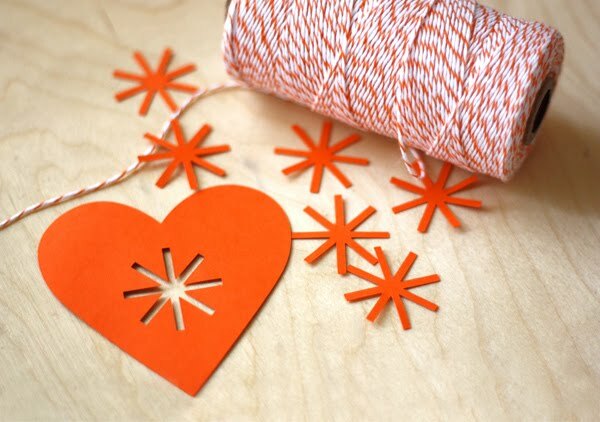 Oh so sweet...I like the idea of using orange! Adrienne, here's a look at the orange clock. You'll need to download the Cutting Master 2 from Craft ROBO. Get it here. Apparently the Craft ROBO and Silhouette machines are similar. Anyhow, once it's installed, Illustrator's file menu will have a new item at the bottom that says something about Craft ROBO (I forget what exactly.) Make sure the Silhouette is hooked up and on, then choose that menu item. You'll find buttons for positioning your graphic on the cutting mat and then you can push the button to send to the cutter. So cute! And reading the comments is a hoot! so I totally laughed out loud. for quite a while. THAT was hilarious. thank you ;) And cute garland too! Love the garland and am very concerned that you had to add the disclaimer about non-orange paper. Concerned for humanity/the gene pool, that is. I love how about Orange even though I am a purple fan. That is so much fun, what a great garland! Thanks so much for the template, I'll be spreading the word about it. I was able to just open the PDF file in my silhouette, and use the Trace tool to get the cut lines set. Thanks so much! Thank you so much for this post. I want to let you know that I posted a link to your blog in CBH Digital Scrapbooking Freebies, under the Page 13 post on Feb. 14, 2011. Thanks again. I love this garland and have been waiting for the perfect opportunity to make it...which would be my sister's baby shower! I cut everything by hand (my hand hurts) and have the baker's twine, but what did you use to attach the twine to the back of the hearts??? I used clear matte finish tape. You could run the twine along the top two points of the heart attached by two tiny tabs of tape if you wanted it to show less. Or cut two small slits and string the twine through. Great, thanks so much! Love your blog!